Not so long ago, Ukraine practically did not exist in public awareness. It was not often mentioned in the news, and it was quite normal for most people not to know where it is on the map. Then the country, with its dramatic and often tragic history, was forced to be talked about after the events of 2014, when Russia annexed Crimea, starting the war that continues today. 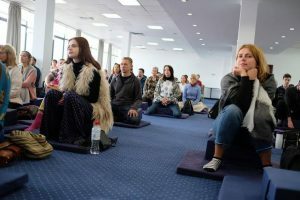 Shambhala in Ukraine was founded in the beginning of 2000, when the first programs and Shambhala Training took place. This, in turn, gave rise to Shambhala groups in Ukrainian cities, first in Lviv and Kiev and later in Ivano-Frankivsk and Odessa. To see the Sakyong in Ukraine was a long-time dream of the Ukrainian sangha, and we were waiting for this event practically from the very beginning of our existence. And that day finally came: His Holiness Sakyong Mipham Rinpoche landed in the Lviv airport, named after the King Danylo Halytskyj. The very next day all main regional media held a press-conference during which they asked Rinpoche many interesting and challenging questions. In the evening Lviv’s citizens read and heard Rinpoche’s answers on TV, radio, and internet about the main issues relating to the visit itself and the wide spectrum common to all humankind. This visit invoked lively interest from many levels of our society. 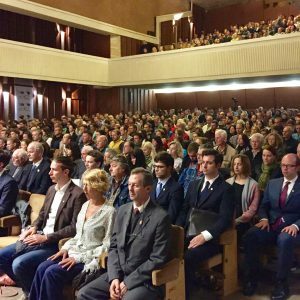 As a result, on Friday, September 22nd, the Palace of Youth (a building in the gray pompously Soviet style from the 1970’s) was completely filled by more than 600 people who came in order to personally hear Sakyong Mipham’s teachings. The talk was about our humanity, society and its future, and about space. Watching the reaction of the auditorium, it was obvious that his words were directly pouring into people’s hearts. 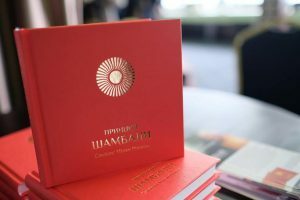 Especially for the occasion of the visit, the translation of The Shambhala Principle was published in Ukrainian language. The line for Rinpoche to sign the book was so long that some of the coordinators got nervous; they needed to transport everything from this place to the hotel Dnister where the next morning Level One of Shambahla Training was going to take place! 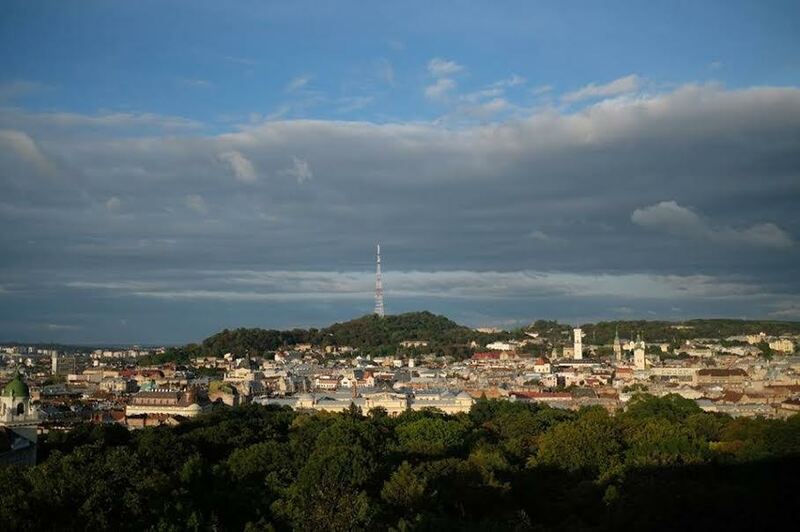 The first thing that everyone noticed on the top floor of the Hotel Dnister was the fantastic panorama of our ancient town, with its roofs and spires, castle mountain, and wide horizon. Mind naturally expands and slows down, embracing the space. Acharya Beate Kirchhof-Schlage started Level One with a concise summary of the Friday talk, because not everyone of the 170 participants was there the night before, and therefore didn’t hear meditation instruction. She received her acharya title very recently and the opportunity to co-teach the Level One with The Sakyong was a special honour for her; she guided the students in a most competent, joyful, and knowledgeable way. 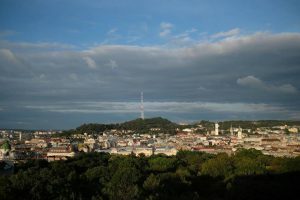 Participants were mostly from Lviv and Ukraine, but there were also representatives from the Czech Republic, Poland, Russia, Hungary, Western Europe, and the United States. Especially noticeable was the group from Vermont, the presence of which was connected, without any doubt, with perhaps invisible but nevertheless powerful karmic connections. Rinpoche gave deep and detailed introduction of Shambahla Meditation, and during the same evening blessed the new Lviv Shambhala Centre. Communication with the Ukrainian sangha was intense and direct. The Sakyong shared his latest practice that he composed while in Lviv, about which we will most likely hear soon throughout the Shambhala Mandala. This moment of communication of the lineage holder with both his older and younger followers was very personal and touching. The evening ended with fundraising for the needs of our not yet very accommodating center. Heartfelt and joyful celebration among representatives of different Shambahla sanghas took place аt numerous restaurants and bars of the city throughout the night. Sunday was the last day of the program. 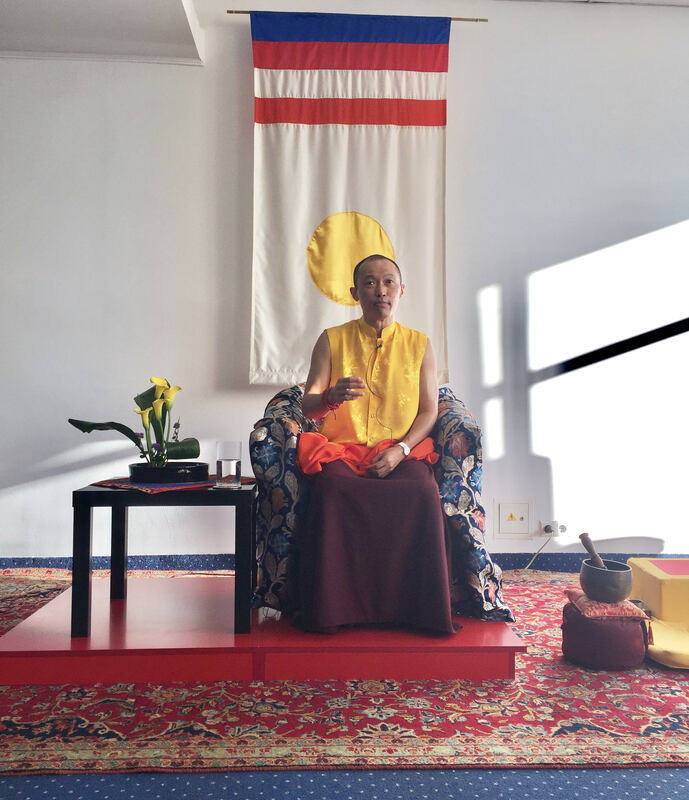 As the Level was approaching its end, during his last talk Rinpoche emphasized the importance of bravery, and of the aspiration for each of us to change something in our life for the better. Finally, as an expression of gratitude, Ukrainians offered the Sakyong a painting (made in traditional technique) of Kozak Mamai – the Ukrainian archetype of the warrior. Two songs were performed in authentic Ukrainian style. The feeling that East met West, and that Rinpoche’s mind met and felt the local energy as well as all the participants, was especially strong at this moment. So also was the feeling of the new beginning of Shambhala in Ukraine. I’m very glad to read this account. I’ve been hearing much about L’viv of late coincidentally. I’ve a friend who started a theater company there ‘Gershom’ I believe it is called, and another new/old friend whose husband is from there and who has been involved with Shambhala in New York. There were and probably still are many Ukrainians in the East Village in New York as there were once many shops there in the 60s and of course restaurants that still exist. I sincerely hope that Shambhala can be helpful to those of you there in a war zone. Good luck to everyone. Wonderful, wonderful. What a momentous occasion for the Ukrainian sangha and the dharma. Reading all this fills my heart with joy. Great present, great future.